Greetings! I’m John Fioravanti, and welcome to the third post on my “Spotlight Blog Tour” sponsored by my new family at Rave Reviews Book Club. I’m very excited to be a guest today with P.H. Solomon. 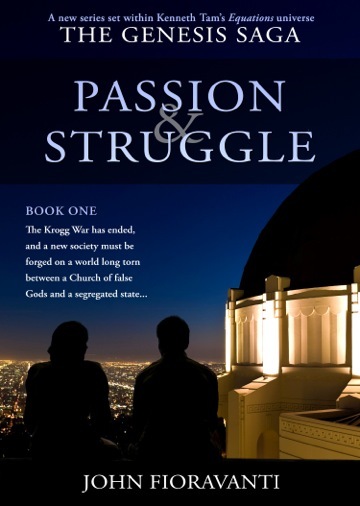 In my last post, I described the nature of my first Sci-Fi novel, Passion & Struggle – Book One of my series, The Genesis Saga. In this post, I am presenting an excerpt from the book, which I hope, will give you some idea of the goings on in 2796 CE in the capital – Genesis City. Marco Rossini is the main character and he is a professor of history at the University of Genesis City (UGC). In this excerpt, we find the good professor wandering across campus to meet one of his students at the Campus Café – ostensibly to give her some direction with her essay assignment. Marco, oblivious to his gorgeous surroundings, on this warm July day, walked across campus towards his mid-afternoon rendezvous at the Campus Café. His lecture that afternoon had sparked memories of political discussions he had enjoyed with his boyhood friend, Pat Conroy. Now, his body on automatic pilot, he cast his mind back to his childhood. Born and raised in Darymanis City, Marco was the only child of Italian parents – who worked at the Conroy Distillery. His mother, Isabella, was Seamus Conroy’s executive right hand in the office, while Giuseppe Rossini was the Master Distiller. Over the years, the Conroy and Rossini families had become good friends, and lived in the same neighborhood in the Naval district. As Marco grew up, the law stipulated that the two social classes of planet Genesis dwell in segregated areas in the urban centers. The faithful Churchers and the Naval or technical class each had their own roles in society and their own residential districts. Fortunately, that division was undergoing change. The friendship between the two families, and their proximity, made it natural that the Conroy boys and Marco become close as well. Marco was the same age as Daniel Conroy and a year older than, Daniel’s brother, Sean. As the three grew up, they became inseparable – more like brothers. Patrick was the youngest Conroy – Daniel’s junior by four years. Often the three older friends allowed the ‘kid brother’ to tag along with them. The professor’s eyes misted as he thought about the young friends he’d lost so many years ago. Against their parents’ wishes, Daniel and Sean Conroy had enlisted in the Navy seeking adventure in space. The Navy provided them the opportunity to show their stuff against Larosian scouting parties, which periodically emerged in Genesis space, through the nearby wormhole. For both young spacers, their exploits ended abruptly when Larosians destroyed most of the Genesis squadron sent out to challenge them. Unfortunately, Genesis Naval technology, built by the Kroggs that controlled the planet, couldn’t match that of their Larosian enemies. In their devastation, Seamus and Irene Conroy clung desperately to their lone, surviving child, Patrick, who had just passed his fifteenth birthday. Forced to grow up sooner than he had ever anticipated, Pat buried his grief deep within, and promised himself to avenge the brothers he’d idolized. Marco and Pat had clung to each other in shared grief. It was the foundation of the close bond that blossomed between them in the ensuing years. In the weeks following the double funeral, the two became inseparable. Marco willingly embraced the mantle of ‘big brother’, and became the only person to whom Pat would open his heart. Neither of them realized just how much Marco was leaning on his ‘younger brother’ emotionally. To his parents, friends, and to the people who knew him, young Patrick Conroy remained a quiet tower of strength as he made plans for bloody vengeance. Only Marco knew those plans, and he cringed at the thought that Pat might meet the same fate as his brothers. Pat persevered and diligently applied himself to both his academics and physical conditioning. Entrance into the Genesis Naval Academy was not easily achieved. Only the brightest and the best were accepted into officer training, and he was determined earn a leadership role in the Navy. Marco kept Pat’s secret, knowing that the Conroys would do everything in their power to dissuade him if they knew. The heaviness in Marco’s heart gave way to swelling pride as he looked back at the support he had given to his ‘little brother’. Young Pat Conroy, a born leader, had become mature beyond his years; so despite his fears, Marco had supported him in every way he could. That encouragement had continued even after he himself left Darymanis City to study at the University of Genesis City. Early in their new relationship, Marco and Pat discovered that they shared a passion for human history on pre-Omega Earth. But the two friends shared more than just a passion for history and politics; they were sparring partners whenever they could take the time out of their busy lives. Not long after Pat entered the Academy, Marco indicated that he wanted to learn the finer points of personal combat that Pat learned in his officer training. Marco was an adept student and the two men became well matched in a short time. Whenever Pat was away on missions, Marco kept his skills honed by utilizing computer-generated hologram opponents in the holo suites in the university fitness center. It had been four long years since the two men had sparred together, and Marco was excited by the imminent return of his friend from the Krogg War. “Oh! Pardon me, Professor Rossini!” The student, who had jarred the briefcase loose from Marco’s grip, bent and retrieved it from the stone-paved walk. Marco realized, with embarrassment, that the collision was largely his fault for daydreaming. He smiled at the student and sent him on his way. He took note of his surroundings, for the first time since he’d left the classroom building, and saw that he had arrived at his destination. Darn good thing that kid ran into me… I would have breezed right on by! Wake up Professor! As soon as he stepped inside, he saw that the café was empty except for Beth Carter, who waited for him in a rear booth, and one man, sitting at a nearby table. He’d expected a crowd of students and faculty at this time of day. Carter caught sight of him, and smiling, she waved at him. Nodding in acknowledgement, he made his way to her booth, placed his briefcase on the seat opposite her and sat beside it. Just then a waiter appeared with two steaming cups, a dish of creamers and sugar packets. Marco shook his head, “I take it black, thanks.” The professor took a sip, surprised to experience an unpleasant aftertaste once he’d swallowed the coffee. He smiled, checked the time and urged Carter to begin the discussion about her research paper. Beth launched into her topic, explaining how Athenian democracy in ancient Greece on Earth fascinated her. Marco listened, as he sipped his coffee, wondering when this girl was going to get to the issue that was giving her trouble. As she questioned how the paper should be structured, his vision began to blur. He shook his head and rubbed his eyes trying to stay focused on her words. Before long, he put his cup down and loosened his necktie. “So warm in here… ugh… don’t feel well.” As he looked at his companion across the table, the room began to move, the hanging lights flickered, and his body fell sideways along the bench. He saw Beth get up, felt someone grab his arm, and then, everything went dark. The phony waiter joined the man sitting at the nearby table. Together, they eased Rossini out of the booth, and grabbed his arms and legs, while Beth took his briefcase. They carried the professor through the kitchen and out the rear door into an alley where a car waited. The real waiter, the cashier, and the cook were unconscious at a table near the back door. No one inside or outside the café saw Rossini being manhandled into a car which sped away. Five minutes later, the three drugged café employees regained consciousness, wondering what happened to them. Once they were steady enough, they checked the café and found nothing amiss. The window shutters were closed and a sign hung on the door saying the café was under repair. They looked at each other, shrugged and returned to their jobs. The waiter cleared the booth and the other table, while the cook went about his preparations for the impending supper hour. They decided not to share the mystery with anyone else. It wasn’t worth losing their jobs. Hmm… who is this Beth person and her confederates? What will become of our esteemed professor? Find the answers in Passion & Struggle! 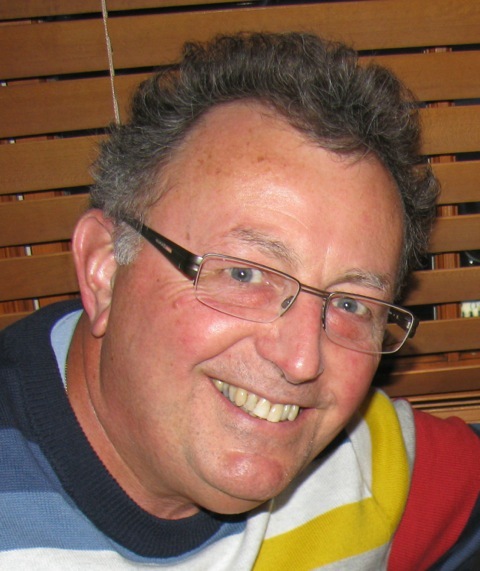 John Fioravanti is a retired secondary school educator who completed his thirty-five year career in the classroom in June, 2008. His teaching career was split between two schools: St. Benedict CSS in Cambridge, Ontario and St. David CSS in Waterloo, Ontario. Throughout his career, John focused on developing research, analysis, and essay writing skills in his History Classroom. This led to the publication of his first non-fiction work for student use, Getting It Right in History Class (Data Based Directions, 2002), along with an international version of the same title. A Personal Journey to the Heart of Teaching (Iceberg Publishing, 2007, 2008, 2010) (Fiora Books 2014) is his second non-fiction work; it attempts to crystallize the struggles, accomplishments, and setbacks experienced in more than three decades of effort to achieve excellence in his chosen field. At present, John lives in Waterloo, Ontario with Anne, his bride of forty-one years. They have three children and three grandchildren. In December of 2013, John and Anne founded Fiora Books for the express purpose of publishing John’s books. After four decades of marriage, they decided to become business partners as well.